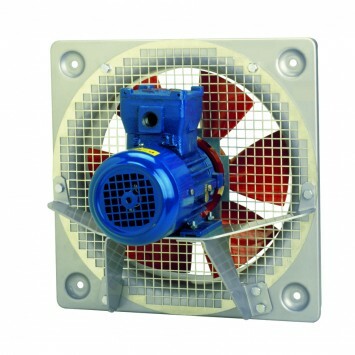 Range of plate mounted axial flameproof fans. Mounting plate manufactured from galvanised sheet steel fitted with an internal aluminium ring and motor support manufactured from heavy gauge aluminium sheet. The whole assembly is protected by aluminium paint finish B-0920. Impellers manufactured from one piece die-cast aluminium with aerofoil profile fixed blades and finished in a high temperature paint coating (red colour). Available, depending upon the model, with single or three phase motors in 4, 6 or 8 poles. All motors incorporate ball bearings greased for life. For the single phase motors, the capacitor is provided not fitted on the fan. It must be installed outside of the ATEX area or within an electrical main board complying with ATEX Directive. Air direction: form (B) configuration (Impeller over Motor) only for 450 and 560 models.